In 1937, the University of Southern California accepted a gift from Elizabeth Holmes Fisher to construct what is now known as the USC Fisher Museum of Art, dedicated on November 14, 1939. In addition to founding the museum, Mrs. Fisher gave to the University a significant portion of her art collection. Between 1939 and 1951, Mrs. Fisher donated a total of 74 paintings, drawings, and sculptures by European and American artists. The Elizabeth Holmes Fisher Collection is comprised of 19th century American Hudson River School and French Barbizon landscapes; 17th and 18th century British portraits; and Dutch and Flemish masterworks from the 16th through 18th centuries. Fisher began collecting American paintings for the museum in the early 1940s, focusing on the first American painting tradition, the Hudson River School. These works celebrate the beauty of the American landscape, the pioneering spirit of the young nation, and the development of a burgeoning civilization. The collection of nine paintings spans five decades of American landscape painting and includes one singular example of work by each artist: Albert Bierstadt, Thomas Cole, Thomas Doughy, Asher B. Durand, Alvan Fisher, William Hart, Henry Inman, George Inness, and David Johnson. Also included in the collection is a watercolor by Winslow Homer. Vose Galleries of Boston, the first American importer of Barbizon paintings, held its first of ten annual sales in Los Angeles in 1928, making 19th century French landscapes available for California collectors. Fisher purchased several works from this sale and by 1939 had assembled a tidy collection (including one pastel) representing the French Barbizon School of landscape painting. The members of the Barbizon School saw Romantic idealization of the countryside as a form of escapism from urban banality. Each artist worked while visiting the village of Barbizon, in the area around the Forest of Fontainebleau. They are considered to be the pioneers of plein air, or open air, landscape painting. Some, like Jean Francois Millet and Gustave Courbet, idealized the peasant or the labors of agriculture while Theodore (Pierre Etienne) Rousseau specialized in wooded scenes. The paintings of the Barbizon school, while reflecting the individual style and interests of the artist, demonstrate a commitment to recording the changing effects of light and atmosphere in a naturalist landscape. Also represented in the collection are Jean Charles Cazin, Jean-Baptiste-Camille Corot, Charles-Francois Daubigny, Narcisse Virgile Diaz de la Pena, Jules Dupre, Charles Emil Jacque, and Constant Troyon. 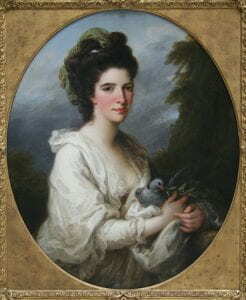 Elizabeth Fisher clearly had a love of British portraits as her collection contains over twenty of them dating from the 17th and 18th centuries. This period was an age of social flux, when new families came to power and others slipped into decline, portraits and landscape paintings became the requisite icons to establish the continuity of kinship and land ownership so important for social acceptance and political advancement. Artists represented in the collection include Thomas Gainsborough, George Henry Harlow, Angelica Kauffman, Sir Peter Lely, George Moreland, Sir Henry R.A. Raeburn, Allan Ramsay, Sir Joshua Reynolds, George Romney, John Russell, Benjamin West, and Johan Zoffany. Close to one third of the entire Fisher Collection is devoted to 16th & 17th century European masters, namely Dutch, Flemish, German and French. The collection contains representative forerunners from the “golden age” in each of four areas of painting: portraiture, landscape, history, and genre. Artists represented in the collection include Jan de Bray, Jan Breughel, Pieter Codde, Jan van Dalem, Marcus Gheeraerts the Younger, Jan van Goyen, Dirk Hals, Bartholomeus van der Helst, Salomon de Koninck, Claude Lorraine, Aert van der Neer, Gaspar Netscher, Jacob van Ruysdael, Adriaen van de Velde, and David Vinckboons.